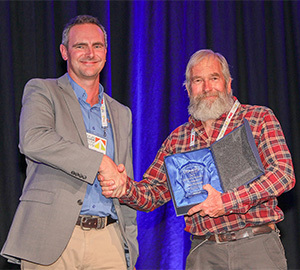 09/04/2019 - We are delighted to report that Dan Papacek (Bugs for Bugs) has been honoured with the ‘Service to Industry Award’ at the Citrus Technical Forum 2019 in Australia. A worthy recipient of this prestigious award, Dan and his wife Anne set up Bugs for Bugs in 1981. Based in Queensland the company is a major player in the Australian market for beneficial insects and other biocontrol products. Having formed a strategic alliance with the Biobest Group in December 2018, the two companies are now collaborating closely. Speaking at the Citrus Technical Forum 2019, held at the Adelaide Convention Centre, Dan took the opportunity to urge growers to rethink their use of IPM in citrus orchards. He outlined a number of new opportunities to maximise pest control while minimising chemical resistance. In a second session, Dan also updated growers and industry on a practical systems approach to managing fruit fly in orchards. Dan started his career as a citrus entomologist in 1978 when he moved to the rural township of Mundubbera to develop IPM in one large citrus orchard. At the Australia Day awards in 2001, Dan was awarded the Member of the Order of Australia (AM) for services to the citrus industry.